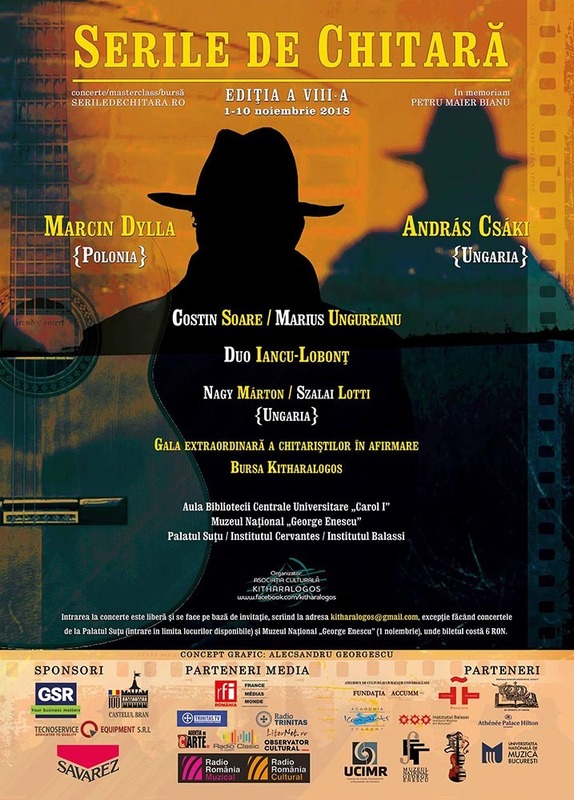 On Thursday, November 1st, the eighth edition of the international “Guitar Evenings” Festival will begin, edition that is dedicated to the memory of Petru Maier Bianu, a filmmaker and writer, who initiated together with Costin Soare in 2008, during the “Iosif Sava” season of the ACCUMM Foundation, the first edition of this event. The opening concert, that will be held at 6 p.m. in the Aula of the Cantacuzino Palace (“George Enescu” National Museum), entitled “Musica della Memoria”, brings together two artists who have known very well the author of the novel Winters’ Inventory, violinist Marius Ungureanu and guitarist Costin Soare: they will present six works in absolute first audition written by some of the most important Romanian composers, accompanied by an unique video montage. During the six concerts that will take place under the aegis of the Kitharalogos Cultural Association, the audience of Bucharest will be able to listen to works such as the famous “Ciacona” by Johann Sebastian Bach, in an arrangement for two guitars presented by Amadeus Guitar Duo – Dale Kavanagh and Thomas Kirchhoff (Canada- Germany), an ensemble formed in 1991 with an impressive career all over the world; “Nocturne, Op. 70” by Benjamin Britten, a true milestone in the history of modern guitar, in the performance of one of the world’s most prestigious guitarists, Marcin Dylla (Poland); “Carols, Sz. 57“, picked up and arranged by Bela Bartok, in an unique formula of 8-string guitars duo, Iancu-Lobonţ Duo. Also, as every year, the youngest guitarists will perform at Suţu Palace in the “Extraordinary Gala of the Guitarists in affirmation”, a recital within which the winner of the “Kitharalogos Scholarship” worth of 2500 RON (plus a scholarship of 2000 RON at ICon Arts Transilvania 2019), offered by the argentine guitarist Pablo Marquez, will be announced. This scholarship will be offered as a result of the development of an unique project in our country, the first online guitar contest dedicated to young performers under the age of 26, which brings in the foreground the recent romanian compositions for guitar. Furthermore, young musicians, this time from Budapest’s “Franz Liszt” Academy of Music, Nágy Marton and Szalai Lotti, two valuable guitarists with important prizes at national and international competitions, will sustain a concert with works for solo and two guitars at the Hungarian Institute in Bucharest-Balassi Institute. Within the festival, there will also be 5 masterclasses dedicated to pupils and students, masterclasses that will take place at the Balassi Institute and at the National College of Arts “Dinu Lipatti”. Petru Maier Bianu (1947-2011), filmmaker and writer, born on September 2nd 1947 in Sibiu, has made short and long artistic films, documentary films and theater plays in the country and abroad. He debuted in 1990 with the volume of lyrics Epic Preludes, at the Eminescu Publishing House, and in 1999 he published at the Romanian Book Publishing House the first edition of his novel, Winters’ Inventory. He was the president of the ACCUMM Cultural Foundation and the coordinator of the Workshop of Universal Culture and Civilization. Passionate about classical music, he initiated the first independent season in Bucharest, the “Iosif Sava” season of the ACCUMM Foundation, which has been carrying out its weekly concerts for over 20 years at Suţu Palace. Entrance to the concerts is free and is based on an invitation, invitation that can be obtained by writing to [email protected], except for the concerts at Suţu Palace (entrance to the available seats) and “George Enescu” National Museum (November 1st, where the tickets cost 6 RON). For more information, please visit www.seriledechitara.ro and www.facebook.com/kitharalogos . Sponsors: GSR Audit & Expertise, Bran Domain Management Company, Tecnoservice Equipment SRL, Savarez. Partners: Central Univeristy Library “Carol I”, National University of Music Bucharest, Cervantes Institute, Balassi Institute – Hungarian Institute of Bucharest, “George Enescu” National Museum, ACCUMM Foundation, The Union of Interpretative Creation of Romanian Musicians (UCIMR), ICon Arts Transilvania 2019, National College of Arts “Dinu Lipatti”, Athenee Palace Hilton Bucharest. Media Partners: RFI Romania, Observator Cultural, Radio Romania Cultural, Radio Romania Muzical, Radio Trinitas, Trinitas TV, Agenţia de Carte.ro, Radio Clasic, Liternet.ro.